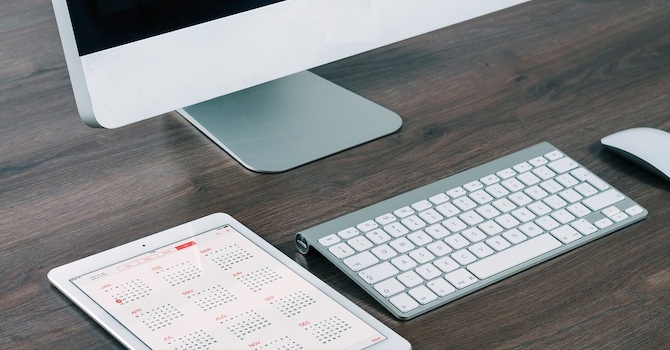 Regardless of the size of your WordPress website, scheduling posts offers a variety of benefits that can help you increase productivity and traffic. Let us take a look at these benefits, and what options you have to further enhance the core functionality that WordPress offers for scheduling your posts. Reaching as many people as possible with your fresh content is a vital ingredient for any successful WordPress website or blog. In addition, reaching the geographic regions your content is aimed at, during peak-times, allows you to maximize the amount of visitors you will welcome. By using an analytics solution of your choice, you are able to monitor which days and times your WordPress website receives the most amount of traffic. Scheduling your posts accordingly to reach regular readers and random website visitors will help you increase your traffic throughput overall. Most people like consistency, and if your content is published at the same time every week or even every day, your target audience will know exactly what to expect, and when. Scheduling posts is automatically handled by WordPress. That way you don't need to make sure you're available to keep logging in on your website to hit the publish button on time. Even if you're beginning to build up a backlog of publishable content, try experimenting for a few months. You can for example schedule your content to be published at the same time consecutively to see if that makes a difference and then change the schedule to see if the results are different. This brings us nicely onto the subject of building up a backlog of content that is ready for publishing. For some it might be difficult to hold on to content that is publishable. However, if you're open to experimenting for a month or two you may notice a positive trend developing if you're scheduling posts to be published on a consistent schedule. You can also make use of backlogged content during lean periods of activity. Having posts you can quickly publish to help improve a temporary decline in website visitors is something every WordPress website owner or blogger wishes they had in their arsenal – just in case it's needed. The process of scheduling posts in WordPress is a simple one and can be carried out with ease using your WordPress dashboard. When writing or editing any of your posts, locate the Publish section within your sidebar on the edit post screen. Click the Edit link that is alongside your posts' publish date. There you'll be presented with the option of changing the post date. Take advantage of WordPress core functionality when scheduling posts on your website. Now you can change this date to a date in the future. By doing so the blue Publish button will change to a Schedule button. Hit the button to complete the process. 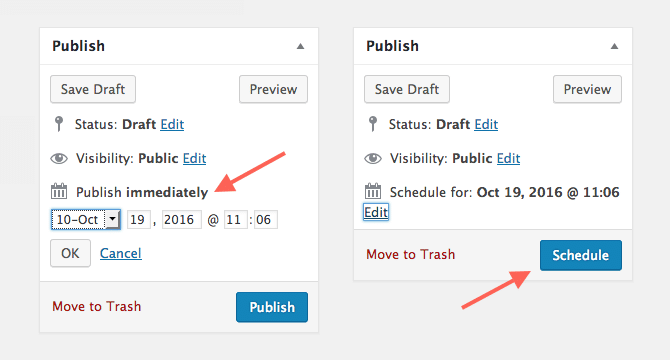 WordPress will now automatically publish your scheduled post at the precise time of your chosen publishing date. If you would like to enhance the WordPress core functionality of automated publishing, then there are a variety of plugins for scheduling posts available to you. We have handpicked a few of these based on good reviews and a large user base. Of course, there are several more you could try out. The WP Scheduled Posts plugin further enhances WordPress core functionality of scheduling posts. The plugin adds a customizable dashboard widget that will display a list of all upcoming scheduled posts and allows you to customize other post scheduling elements with ease. You can also limit which of your categories and custom post types are capable of containing scheduled posts. As the plugin name suggests, the Schedule Posts Calendar plugin adds a graphical calendar to your posts' publish widget. 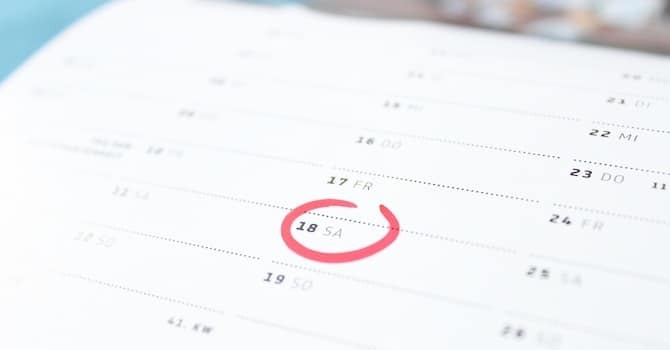 This post scheduling plugin thus allows you to select your chosen publish or schedule date by just picking the date from the displayed graphical calendar with a few clicks. Auto Post Scheduler is a handy lightweight plugin that offers you the ability to set up automated scheduling for your unpublished content. This removes the need to add scheduled publish dates to your posts on an individual basis. You're thus able to heavily customize your chosen publishing schedule which further allows you to restrict automated publishing to certain categories, days of the week, post types, and even re-publish old content should you wish to do so. Publish to Schedule is another automated scheduling WordPress plugin. Just like the previous plugin, it also removes the need to set your desired scheduled publishing date and time for each of your posts. By taking advantage of the simple configuration options, you can define a schedule that all future published posts will adhere to – so you have less work to do. When scheduling posts, the choice is up to you. You can either use existing WordPress core functionality to schedule your posts, or take advantage of some of the above mentioned automated scheduling plugins, which can make this process an even easier and more flexible task. In either way, scheduling posts in WordPress is great to optimize the workflow on your website in several ways, by publishing content during peak traffic times or establishing a regular schedule for publishing posts. On top, scheduling posts allows to manage and handle your content backlog which can be very useful in times of declining traffic.